Review: "Sign of The Southern Cross, The: ...Of Mountains And Moonshine" - Sea of Tranquility - The Web Destination for Progressive Music! Very few debut albums hit you with an original and innovative sound, in fact most happily and understandably wear their influences on their sleeve. 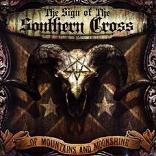 With ...Of Mountains And Moonshine The Sign of The Southern Cross don't only have PANTERA sewed onto their shirts, it's damn well tattooed on their chest, forehead and any other available body part they had exposed at the time. TSoTSC do make a most enjoyable racket, with Seth Uldricks ranging guitars and Anselmo like vocals grabbing the limelight from the off and barely relinquishing it throughout the whole disc. He is a powerful singer and dexterous six stringer, however it is extremely difficult to refer to his style without mentioning either the sorely missed Dimebag Darrel or Phil Anselmo. Tracks like "Scry", "Appointed Reaper" or "The South Is Rising" all display that southern swagger and confidence needed to carry this heavy crushing music and are indeed brutal assaults that do convince that Uldricks, Adam Ranke (bass) and Brett Wilson (drums) have the ability to put together some memorable metal music. The slower "Eating The Sun" sees Uldricks play with a subtly that suggests that he could easily turn his hand to any style he chooses and it is this little flash that gives the impression that once TSoTSC make inroads as to what their own sound should be that they may well be a force to be reckoned with. Basically if you are excited at the prospect of an album heavily inspired by Pantera then The Sign of The Southern Cross are most definitely for you, if not wait to see what album number two holds.